ADALBERT, a monk at the Abbey of St. Maximin in Trier, and missionary bishop. At the request of St. Olga, in 961 St. Adelbert led a group of missionaries to evangelise the Slavs. There they met great resistance led by St. Olga’s son Svyatoslav, and many of St. Adelbert’s companions were slaughtered. The survivors, including St. Adalbert, escaped to Mainz where they spent several years. St. Adalbert was then appointed Abbot of Saint-Pierre-et-Saint-Paul de Wissembourg in Alsace. He was consecrated the first Archbishop of Magdeburg in 968. St. Adelbert founded the dioceses of Naumberg, Neissen, Merseberg, Brandenburg, Havelberg, and Posen, and was made Metropolitan of the Slavs. Known for his strong belief in the importance of education in general, and his monks in particular, St. Adalbert counted SS. Bruno (15th October) and Adalbert of Prague (23rd April) amongst his disciples. St. Adalbert reposed 981. Gained the crown of life, O Christ our God. Offering up his head to you, the Judge of all! ALBAN — The Protomartyr of Britain, when the chief magistrate of Verulamium (present-day St. Albans, Hertfordshire, England) ordered that all the Christian priests be arrested, tortured, and then killed (either circa 209 or 305), a priest, known to us as Amphibalus, fled and St. Alban sheltered him in his home. The priest’s piety impressed St. Alban and he asked to be taught about the faith. St. Alban soon embraced Christ and was baptised by Amphibalus. The authorities became aware that St. Alban was hiding a fugitive, and soldiers were sent to arrest the priest. As the soldiers arrived, St. Alban and Amphibalus exchanged cloaks, resulting in St. Alban’s arrest and Amphibalus’ escape. St. Alban was brought before the magistrate who was furious that St. Alban had helped the priest escape. However, he offered St. Alban the opportunity to be freed without punishment if St. Alban would renounce Christ, offer a sacrifice to idols, and reveal where Amphibalus was hiding. 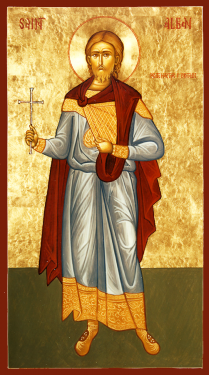 St. Alban replied that he was a Christian and worshiped the one true God. The magistrate had St. Alban beaten and tortured, and once again offered to free him if he renounced Christ. St. Alban again refused, rejoicing in the suffering he was experiencing for the glory of God. The magistrate then ordered that St. Alban be taken to Holmhurst Hill outside the village and beheaded. In his Historia Ecclesiastica, St. Bede the Venerable (25th May) relates of several miracles associated with the story of St. Alban’s execution. One, that the bridge crossing a river which separated Verulamium and Holmhurst Hill, was full of people who had come to witness St. Alban’s martyrdom, preventing the execution party from continuing up the hill. St. Alban stood and prayed, making the Sign of the Cross over the river, which then parted, allowing the execution party to pass. The executioner was so astonished by this that he threw away his sword and refused to carry out the execution. He too was arrested and a replacement was selected. Another miracle linked to is that as they climbed Holmhurst Hill, St. Alban became thirsty and asked for water. At this point a small spring gushed forth and the saint could drink. Though the well is now dry, for many years pilgrims came to drink from this Holy Well. One of the last miracles connected to St. Alban’s martyrdom is that as the replacement executioner struck St. Alban’s head off, the executioner’s eyes came out of his head and fell to the ground. These miracles led to many conversions amongst the crowd of spectators. BAGNE (BAIN, BAGNUS), a monk and disciple of St. Wandrille (22nd July) at the Abbey of St. Peter in Fontenelle, Normandy, who was consecrated Bishop of Thérouanne, in Artois, Flanders, 667. After twelve years, St. Bagne resigned his See and returned to Fontenelle where three years later he was elected Abbot. Towards the end of his life, St. Bagne was appointed to serve as Abbot of Fleury as well. St. Bagne reposed circa 710, and is the primary patron-saint of Calais. FLORENTINA (FLORENCE), the only sister of SS. Leander (27th February), Fulgentius (16th January) and Isidore (4th April). St. Florentina was orphaned whilst still young, she was raised by her brother St. Leander. When older, she received monastic tonsure, and eventually served as Abbess. St. Florentina reposed circa 636. GOBAN (GOBAIN), a disciple of St. Fursey (16th January), and companion on St. Fursey’s mission to Gaul. St. Goban spent the last years of his life as a hermit in the Voas forest; present-day Saint-Gobain. St. Goban was martyred by pagan marauders circa 670. GOVAN (GOVEN, COFEN), St. Govan was most likely an Irishman who had been a disciple of St. Ailbe of Emly (12th September) before he went to Wales. He lived there as an anchorite in a fissure in a cliff at what is now called St. Govan’s Head in Pembrokeshire. He is believed to have reposed circa 586 and to be buried under the altar of his hermitage. HELEN (HELIADA), second Abbess of the Abbey of St. Mary in Oehren, in present-day Trier. St. Helen reposed circa 750. NOVATUS, presumed to have been a son of the senator Pudens of Rome, and brother of SS. Praxedes (21st July) and Pudentiana (19th May). St. Novatus reposed circa 151.